Kings of ancient Udaipur built the city with numerous forts and palaces that acted as the winter honeymoon spots for the royals. 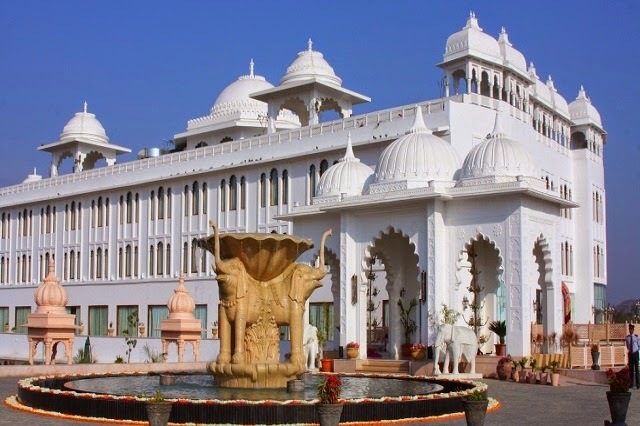 If you wish to enjoy a royal vacation in Udaipur, most of these structures are open to accept tourists and provide a lavishing royal styled vacation. Apart from these, many modern hotel giants have created better accommodation options for those who love pampering. 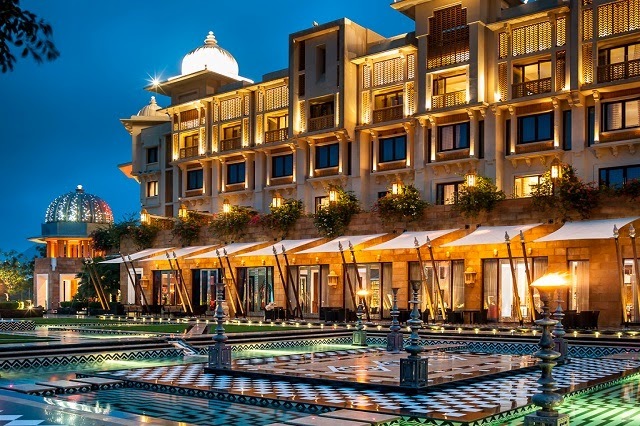 Here are the top ten luxury hotels and resorts that you ought to try in Udaipur. 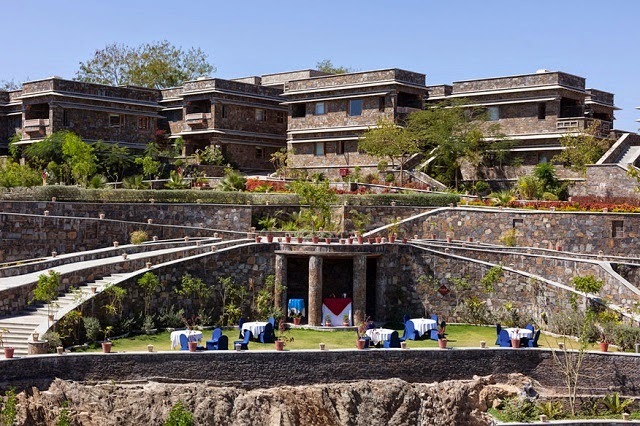 The ancient hunting lodge of Mewar Kings is today resurrected as a grand heritage hotel. The hotel covers 50 acres of sheer luxury. The wonderful view from the garden, giant corridors, ancient courtyards, pavilions, lush gardens and safari options are just one phase of this heritage hotel. Apart from royal history, the hotel also serves modern crowd with spa, private dinner rooms, business facilities, LCD TV, mini-bar, Victorian styled bathroom with all modern fittings and so on. 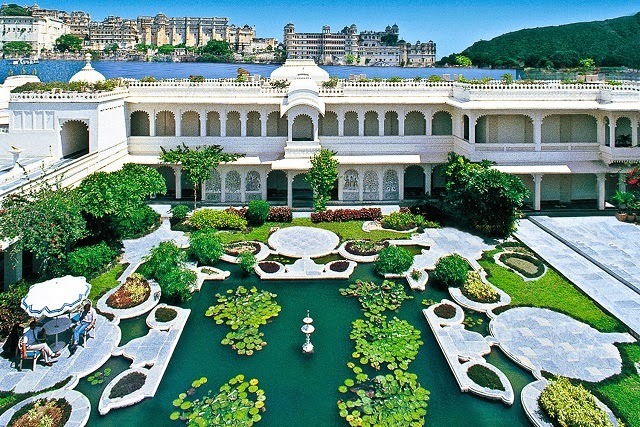 Located in the middle of Lake Pichola, this luxury entity is a renewed 18th century lake palace. The ancient architectural beauty are restored and the palace is laid with mirror work, glit molding and others. The huge corridors allow tourists to enjoy the massive view of the lake and the surrounding regions. When it comes to modern amenities, the hotel has wi-fi connectivity, signature spa, business facilities, banquet halls, conference rooms, swimming pool and much more. 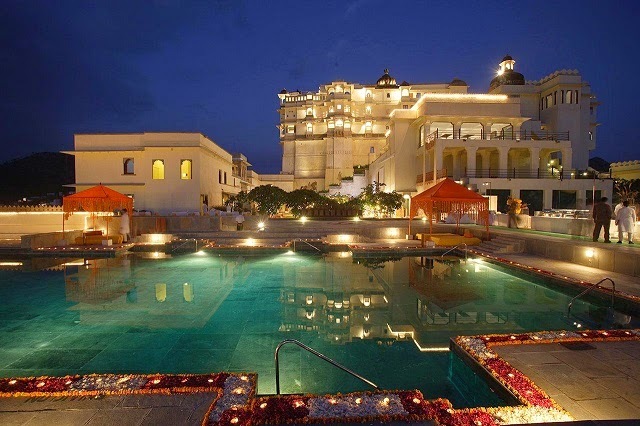 Taj Lake Palace is visited by numerous tourists every year, for a romantic dinner experience. 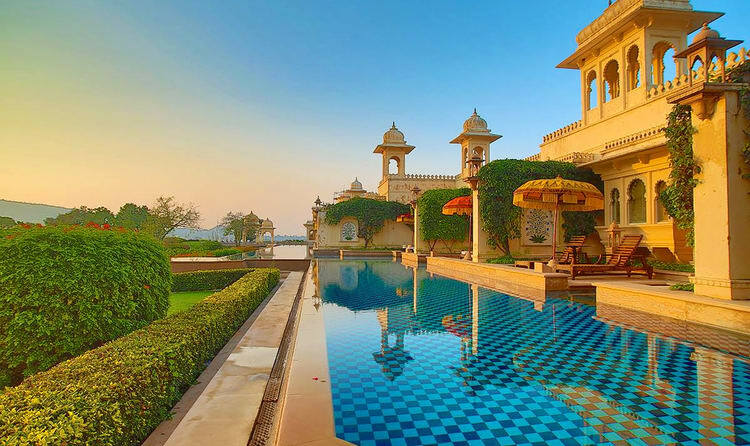 With the backdrop of Aravali mountain, this palace is located close to Lake Pichola. 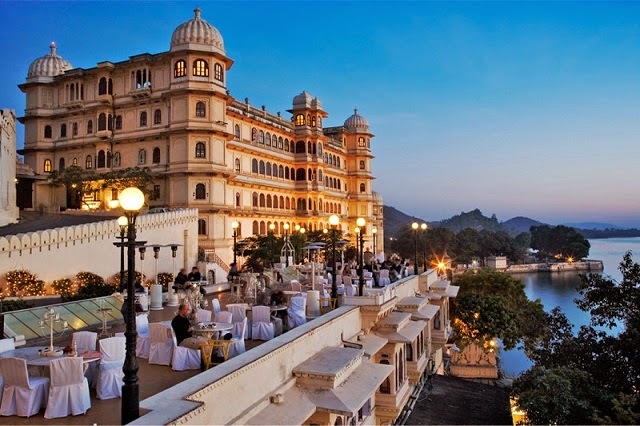 Built in the ancient Mewar style, this palace has hand picked elements starting from furniture to wedding venues. This palace promotes luxury personal events like parties, business meetings, weddings and much more. The hotel also provides cruise options to enjoy a fairytale moment during your stay. 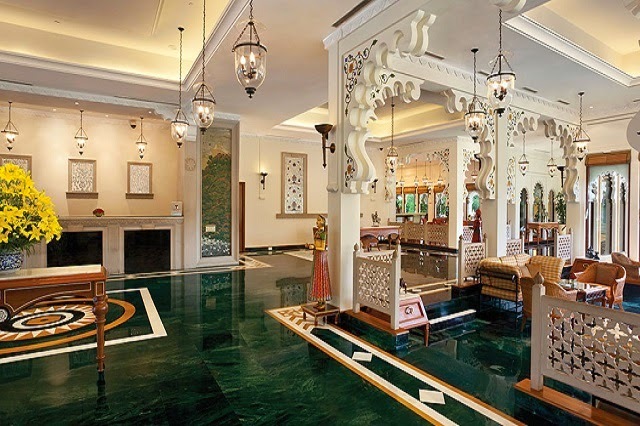 You can find rooms of varying luxury level that will bring you back to the ancient times of Leela Palace. The restaurant in the hotel is famous for roof-top dining as you watch the lake. This is another 18th century luxury palace converted into a heritage hotel. The ancient residence of Delwara is famous for its iconic geographical located in the Aravali mountains. This hotel has managed to maintain its royal décor with interesting modern amenities. You can also rent tented terrace for enjoying a private luxury camping experience. The multi-cuisine restaurant is famous for cooking modern cuisines in age-old traditional techniques. You can also find Indian street food delicacies here. 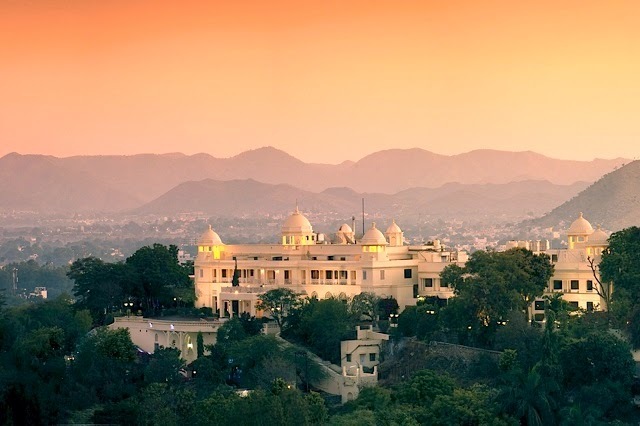 On the banks of Fateh Sagar Lake, this hotel is famous for the exclusive décor and stunning view of Aravali mountains, Sajjangarh fort and the lake. You can find 2-level swimming pool, lounge rooms, business halls, spa, fitness center and other elements that will pamper you throughout the vacation. There are numerous restaurants inside the hotel for you to choose between exotic array of cuisines. Near Lake Fateh Sagar, this mighty palace of 20th century stand today as a heritage hotel. The hotel arranges many exotic activities like camel riding, puppet show, horseback riding and so on. The whole property is riddled with ancient architectural beauty and topped with modern amenities. There are just 55 rooms in this palace and these rooms are filled with many royal and modern amenities. There are two restaurants inside the hotel that provides live Rajasthani folk performances for diners. There is a hunter menu which is famous for its Rajasthani meat dishes. This is a luxury hotel covering 43 acres of paradise near Lake Pichola. If you love outdoor activities, this is the right place to stay. 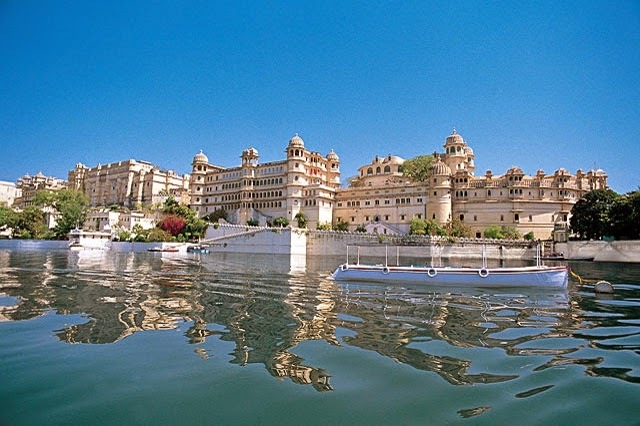 The hotel provides services in arranging special Udaipur sightseeing trips, boat rides and others. You can find many kid friendly arrangements and activities here. Apart from these, you can enjoy the meeting room, spa, swimming pool, terrace dining, bar and lounge. The restaurant serves recipes that were held as secret during the kings’ reign. This is one of a great chain of hotels in India. This hotel is famous for its modern architecture decorated with ancient Tekro Work. You can find courtyards, terraces, verandas and other traditional elements in this hotel. The spa of this hotel is famous for exotic and signature therapies. The hotel has indoor and outdoor activities specially designed for its guests. You can also find many modern amenities like banquet halls, swimming pool, fitness center and others. Located in the City Palace complex, this is the place where King Maharana Fateh Singh performed most of his royal gatherings and special functions for his guests. Today, it is one of the exciting hotels in the city with a good view of Lake Pichola. You can enjoy the culture of the land in the architectural beauty, miniature painting, weapon collections, royal portrait and so on. The spa of the hotel provides authentic ayurvedic massages and treatments. Apart from these historic elements, the hotel rooms are topped with modern amenities for ease of stay. This hotel is located inside the City Palace complex. 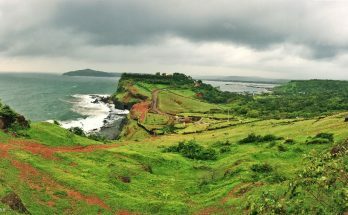 This location makes its easier to scale most of the tourist destinations within a short distance. This king’s home is decorated with ancient styled decor and is filled with modern amenities. The 36 rooms of this palace were used by royal members in the past. Today, it holds amenities like mini-bar, satellite TV, international phone, marbled bathroom and so on. 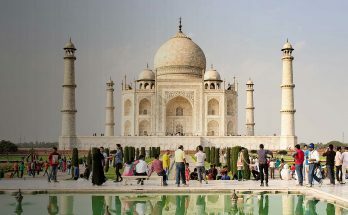 Take a luxurious trip to Udaipur with Deccan Odyssey Train and enjoy the panoramic view with your loved ones and make it memorable for lifetime. 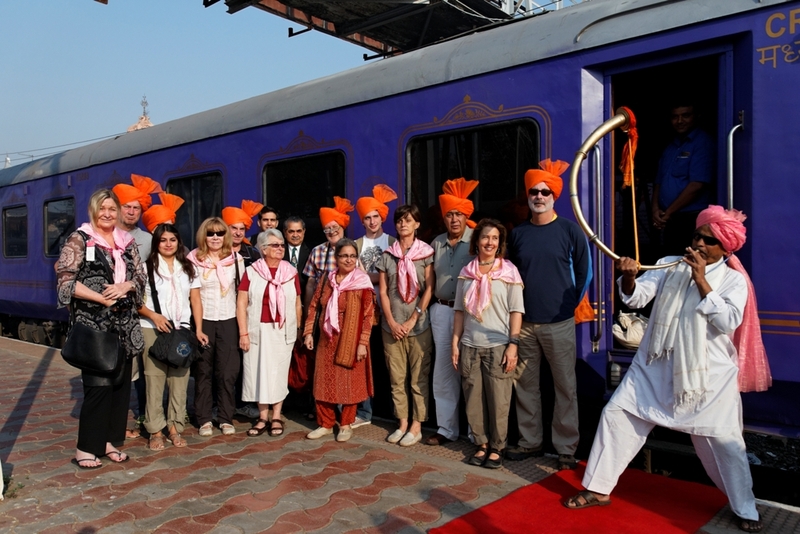 Indian Odyssey and Indian Soujorn are the two luxurious itinerary covered by Deccan Odyssey. 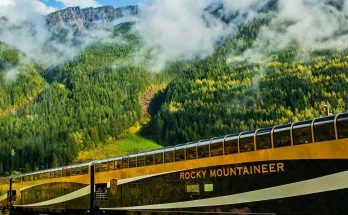 How to book Deccan Odyssey train? So, don’t wait.. Hurry up... Book your tickets now!!!! Why Jodhpur called as the Blue City of India? Copyright © 2019 Deccan Odyssey Blog.